CSLB is looking for veteran contractors in the central part of the state to join its Industry Expert Program (IEP), a group of trade professionals who assist CSLB in investigating consumer complaints. In the Fresno area, C-57 Well Drilling contractors are needed as Industry Experts (IEs). Contractors who hold C-8 Concrete, C-12 Earthwork and Paving, and C-23 Ornamental Metal licenses from the Sacramento region are also encouraged to apply. Industry experts (IEs) serve as independent consultants to CSLB, and are compensated for their time. IEs must be licensed and in good standing with five years of experience as the license qualifier, and have no legal actions against them within the past seven years to qualify for the program. To participate as an IE or for more information, review CSLB's Industry Expert publication, or send an email. An application to join the IE program can be printed, filled out and mailed to CSLB's Sacramento headquarters. 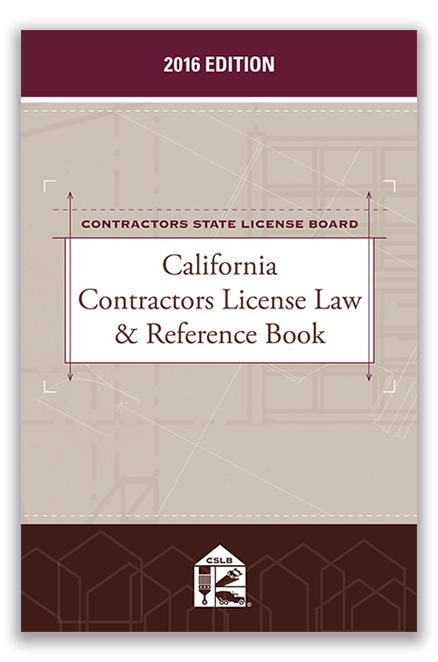 The foremost authority on California contracting law and regulations, the 2016 edition of CSLB's California Contractors License Law & Reference Book, is available for purchase or free viewing. The updated publication, totaling 1,092 pages, provides easy reference to new and amended construction laws that took effect January 1, 2016. The all-inclusive book offers specialized sections about becoming a licensed contractor; home improvement; business management; construction standards and safety regulations; California's Business and Professions Code and other construction-related state codes; and complete Contractors' State License Law rules and regulations. The 2016 law book can only be purchased from the publisher, LexisNexis, and is not available at any CSLB office. Copies may be purchased online, by calling 800.533.1637, or by writing to Matthew Bender & Company, Attn. Customer Service, 1275 Broadway, Albany, NY 12204-2694. This year's law book costs $30.50, plus $10.44 for shipping and handling.